Sleep On Surgery Choice For Obstructive Apnea : Shots - Health News Sleep medicine specialists say surgery to treat obstructive apnea isn't the best first choice. Start with a breathing device called a continuous positive airway pressure mask, they recommend. When Eli Walker talked with his ear, nose and throat specialist near his Silver Spring, Md., home about how to treat the obstructive sleep apnea he'd just been diagnosed with, the doctor's first recommendation was that he have surgery to remove some of the soft tissue at the back of his throat. 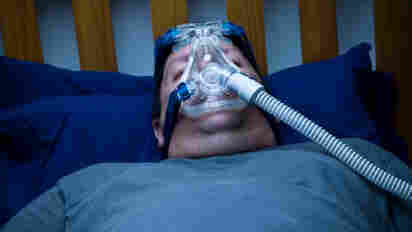 An uvulopalatopharyngoplasty (UPPP), as it's called, would hopefully widen his airway, curing him of sleep apnea, which caused him to snore loudly and stop breathing for brief periods throughout the night when the muscles in his throat relaxed and the tissues collapsed in on themselves. The sort of apnea affects at least 2 percent to 4 percent of people, and it isn't just a nocturnal nuisance. This kind of apnea can have serious consequences, including raising the risk of heart attack and stroke. But as Walker, 63, discovered when he started researching the procedure is that despite its impressive, palate-mangling name — "U-triple-P surgery," as it's sometimes called — is only successful over the long haul in about half of people. "I thought, 'That doesn't sound so good,' " he says. Sleep medicine specialists agree. "Surgery is really considered a second-line therapy," says Dr. Nancy Collop, director of the sleep center at Emory University and president of the American Academy of Sleep Medicine. The preferred treatment is to fit patients with a breathing device called a continuous positive airway pressure (CPAP) mask that keeps their airway open by pushing pressurized air into it while they sleep. It's not a perfect solution. Between 50 percent and 80 percent of people stop using the mask because they can't get used to it, says Collup. But if they can acclimate themselves, it generally solves the problem. Walker couldn't get used to it. and now has an oral appliance (sort of like a mouth guard) that repositions his jaw to keep his airway open while he sleeps. Finding a solution for sleep apnea may take time. But if your doctor suggests surgery before you've exhausted other options, consider getting a second opinion.